Much of the power and effectiveness of the Episcopal Church is because we all participate in common rituals. The blessings, prayers. and statements of faith are spoken by over 80 million Anglicans around the world every Sunday. It’s a time and space warp. You come as an individual, but you are actually part of a collective force of people who are all disciples of Christ and who are speaking the same words and praying the same prayers at the same time as you. It’s comforting. It's thrilling. All of us are experiencing the same reverence, awe, and peace at that very moment. You feel a deep connection when you realize that you are an important part of a worldwide outpouring of joy. Services are well-ordered. Episcopal services are formal and structured compared to some protestant denominations. We take pride in the fact that the same worship service is happening around the world in thousands of churches. There is a formal structure, and a pace and flow refined over many centuries. You will find it predictable, sacred and supremely comforting. Music. The music you hear in our church was not written for you and me. It was written for God. The music at the 7:45 and 10:30 services is from the 1982 hymnal. It is the classical canon of the oldest english-speaking Christian musical tradition. (At the 10:30 service, we are joined by full parish choir and our thundering pipe organ.) The music at the 9:00 service is more contemporary and may include guitars, woodwinds and piano accompaniment. Dress. There is no dress code. You'll see men wearing everything from jeans and T-shirts to three-piece suits. Women attend wearing dresses and pretty hats (especially at Easter), denim skirts, jeans or capris. Dress however you feel comfortable in the presence of God. Parking: There is a parking lot across the street and ample (free) street parking. This is one of the nicest neighborhoods in Bellingham, and it's perfectly safe to park your car and walk to the church at all hours of the day. Children: Children are welcome in the services. For younger children, there are activity bags in the rear of the church; there is also a well-staffed and equipped nursery, and programs for all school-age children. Help. The Ushers and Greeters are always available to answer questions and provide assistance. Special Needs. We have wireless hearing aids. (If you actually want to listen to the sermon, just ask an usher.) The building is handicapped-accessible with ramps, elevators, and wide doors. (The ushers will be more than happy to help you navigate the building.) We also have large-print Books of Common Prayer. (If you would like to use one during a service, ask an usher.) We also have gluten-free bread at the communion altar. Stand up. Sit Down. What's going on? There's no wrong way to do your pew aerobics. And we like to keep you awake. Episcopal congregations across the world have different rituals and sit or stand at different times. Just watch the congregation and follow along. You do not have to kneel. It is perfectly acceptable to kneel or stand during the formal prayers. (However, hunkering down in the pew is discouraged - we try to be bold - to be technically correct, you should either stand or kneel in respect for the tradition.) Pay attention. There are rich layers of meaning in every phrase, color, gesture and object. As you dive deeper into this service it gets only richer and more interesting. Fill out a visitor’s card found in the pew, put it in the offering plate or hand it to an usher. This way we can get to know you and it will ensure that you are on our mailing list, and Father Jonathan can contact you if you so desire. * A form of public worship; a prescribed ritual. to hear God's Word through stories in the old and new testament. We believe the human authors to be inspired by God and believe God uses these writings to speak to us today. on God's word through music, silence, and a sermon as we open our hearts and minds to God's message for us. for the Church, the world, and all who share with us this broken world. We respond to God by thoughts and deeds, with or without spoken words. Sin is simply the seeking of our own will instead of the will of God. This frees us from the power of sin and strengthens us to trust God's grace and love. as the congregation greets one another with a sign of the Peace. for God's creation and love for the world as we celebrate the Holy Eucharist. Bread and wine are blessed and become, through faith, the Body and Blood of Christ. As Christ offered himself for us, we offer ourselves to God as we receive the wine, bread and blessings. after we are fed with the spiritual food of Christ's love we are blessed and sent out into the world. We go in peace and to love and serve the Lord with the strength of the Father, Son and Holy Spirit. For 500 years this book has marked the hours (Morning & Evening Prayer), the days (Feasts and Festivals), the most profound sorrows (At the Burial of a Child), the suffering (Visitation of the Sick), happiness (The Order of Baptism), and the crises and triumphs (Prayers and Thanksgivings Upon Special Occasions) of this human life. The Book of Common Prayer has shaped the inner life and branded the tongue of the English-speaking peoples. It's phrases and rhythms did not merely enter our language, they largely defined it. Almost every English speaker on the planet uses phrases from the BCP often without knowing the source. "…to have and to hold from this day forward, for better for worse, for richer for poorer, in sickness and in health, to love and to cherish, until we are parted by death. This is my solemn vow." "…those whom God has joined together let no one put asunder." "Deliver your servant from all evil and set him free…"
"May angels surround her and saints welcome her in peace…"
…to the timeless words of the Book of Common Prayer. On page 845 you will find the basics of our faith clearly and succintly spelled out in Q&A format. It is our Catechism; our FAQ. If you ever need to pray, and don't know what to say, look in the Book of Common Prayer. If you can't express your highest thoughts in words, have a look. It is a monumentally significant work. It's more than a song book! The Hymnal 1982 could be viewed as one of the finest collections of sacred poetry in print. As you flip through the hymnal, note some of the composers and lyricists represented. It's a cultural treasure. Service Music is numbered S1 - S288 in the front of the Hymnal. "Regular" hymns are numbered 1 - 720. We Episcopalians have a habit of setting things to music. We just can't help it. There is music in the form of chants, litanies, prayers and proclamations integrated into the ritual parts of the service. These special musical pieces are preceded by an “S” and are found in the front section of the hymnal. During the service, most Scripture quotations are from the New Revised Standard Version Bible. This is the table, not of the Church, but of the Lord. It is made ready for those who love him and for those who want to love him more. So, come, you who have much faith and you who have little, you who have been here often and you who have not been here long, you who have tried to follow and you who have failed. Come, because it is the Lord who invites you. It is his will that those who want him should meet him here. We understand Communion as participation in the Body of Christ (we are the body of Christ) and the meaning of this ritual flows from the five most important vows we have made in baptism. It is a weekly reminder and recommitment to: (1) continue in regular worship, (2) repent from evil, (3) proclaim the Good News of God in Christ, (4) seek and serve Christ in everyone, and (5) respect the dignity of every human being. If you are not baptized, you are welcome to come to the table for a blessing. Stand at the rail, cross your arms over your chest as a signal to the priest, and you will receive a verbal blessing in the name of Jesus Christ. If you are seeking a deeper knowledge of Christ, please speak to a clergy person after the service. We are here to accompany you on your journey. Baptized children, no matter how young, are welcome to receive Communion. 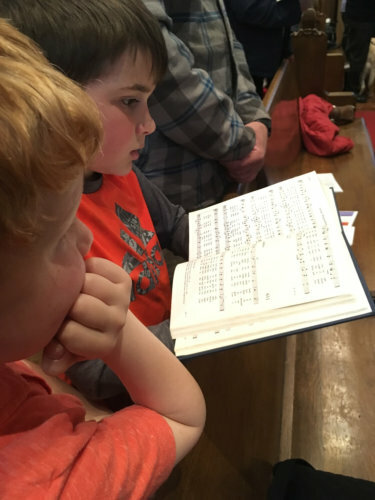 None of us can fully understand the mystery of the Body and Blood of Christ even after a lifetime of study, and so we encourage children to participate fully. Periodically we offer workshops for children and their parents on Baptism and Communion. Speak to a member of the clergy if you wish to have your child baptized. You may kneel at the rail, or stand near it. If you cannot walk to the front, the priest will bring the bread and the wine to you. Stay in the pew and raise your hand, stand up to be seen, or simply remain in your wheelchair. We will find you. Receive the bread in your cupped and outstretched hands. Many people say "amen" or cross themselves to place the cross of Jesus upon them after they eat the bread and drink the wine. Receive the wine by holding the base of the wine chalice and guiding it to your lips. If you prefer not to drink from the cup (to receive by intinction), simply leave the bread in your outstretched hand and a Chalice Bearer will dip the bread in the wine for you and place it on your tongue. To receive a blessing instead of the bread and wine, simply cross your arms across your chest. Eucharist (the Greek word for "thanksgiving") is a most sacred rite for us. The form and substance hearken back to the early roots of Christianity. It echoes the last supper of Jesus with his disciples the night before he was crucified. Each week it reminds us of our relationship to our Lord Christ Jesus. NOTE: There is real wine in the communion chalice: the fermented fruit of the grape. If you wish to abstain from the chalice, you may partake of only the bread. If you do this, rest assured, your communion is absolutely complete (referred to as "in one kind only"). NOTE: Tell us if you wish to receive gluten-free bread; we keep a separate chalice for this purpose. We do our best to remain free of gluten contamination in Holy Communion. If you prefer, we invite you to reach out and take the gluten-free wafer from the plate instead of waiting for it to be given to you. Partaking in Holy Communion means taking strength to live the vows we took in Holy Baptism. We invite you to ask us about how we view Holy Baptism. We welcome your questions. God is at work in you, and St. Paul’s is a place to begin your sacred conversation with God. Prayers for Healing are offered at the Mary Altar (the small altar on the right side of the front pews) during communion. Simply approach the altar before or after receiving Communion, and a minister will pray with you.The Bible teaches us to pray for healing: physical, emotional, and spiritual. Our Sunday morning Eucharist and our Eucharist on the first Thursday of the month at 10 am include an opportunity to come forward to our communion rail for this kind of prayer, with the details of your prayer request shared confidentially between you and the priest. When offering this prayer, the priest will put their hands on top of your head and pray in a soft voice so that others may not overhear. Healing prayer also includes an opportunity to be anointed (marked on your forehead) with healing oil, blessed by our bishop for this special purpose. At the end of the formal service, we have announcements, commemorations and special notes for the congregation. If you have a birthday or anniversary, come to the front and receive a blessing and a prayer from the church family. Then, you are cordially invited to the Great Hall for fellowship and refreshments. Follow the crowd. It's the best coffee in town, and a great chance to learn more about St. Paul's. Visit the Welcome Table and speak with one of our official welcoming team. Introduce yourself. We're all glad to meet you.